Dieter Zetsche presents the Mercedes GLE Coupe in Detroit. 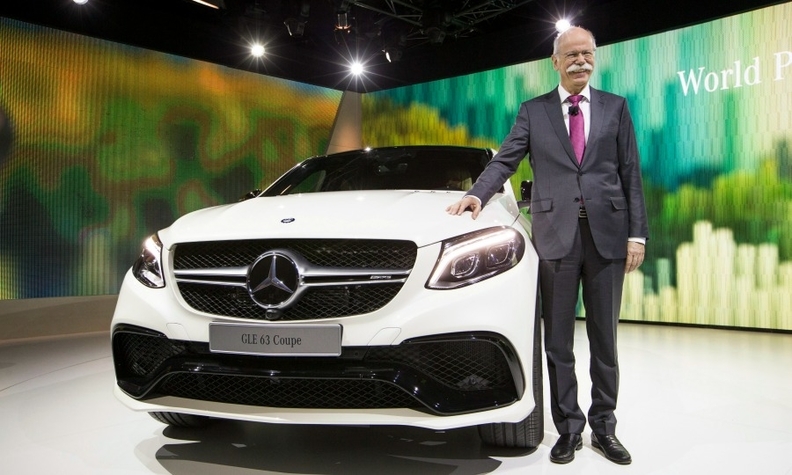 Daimler CEO Dieter Zetsche expects the U.S. economy to see solid growth in 2015 and boost demand for new cars like the Mercedes GLE Coupe, despite plans by the Federal Reserve to end years of easy money policies that boosted demand for cars. The positive outlook for the U.S. economy is key for Daimler’s luxury car brand. Larger rivals BMW and Audi count China as their biggest market, but Mercedes is more dependent on the U.S., which accounted 20 percent of the brand’s 1.65 million car sales last year and remains for now at least the brand’s single largest source of demand. Skittish investors on Wall Street sent stock prices initially lower at the start of this year, with equity prices only recovering some of the losses after the Fed reassured markets that it was not in a rush to tighten policy by prematurely hiking borrowing rates from near zero, where they have stayed since the 2008 collapse of U.S. investment bank Lehman Brothers. Zetsche, a former Chrysler boss who spent many years in Detroit, said he saw parallels between a stronger U.S. economy and a budding fiscal recovery in Detroit. Gross domestic product - the broadest measure of economic activity - should expand by 3 percent this year. “From everything we see from the far side of the Atlantic, I’m convinced the U.S. economy and the car market is on the same upward trajectory as the city of Detroit,” he told reporters during a Mercedes reception on Sunday ahead of this week's Detroit auto show. “Consumer confidence and consumption are gaining further traction, car sales regained levels we haven’t seen since 2006 and we expect further solid momentum also in 2015. So there’s no better time to launch the new products you see today,” he said. Earlier Zetsche showcased the new GLE Coupe, an offroader that eschews the normal rugged SUV appearance in favor of a sportier look. The car, which will compete with the BMW X6 that first created the segment, debuts in the U.S. market in June and hits showrooms in Europe about eight weeks later. A price has not yet been announced, nor has a sales target. Zetsche’s bullish outlook echoes comments earlier in the week from General Motors CEO Mary Barra. She forecast the U.S. car market would grow by as much as 3 percent this year thanks to falling unemployment, a huge drop in the price of gasoline, and a continued recovery in house prices. U.S. car sales rose to 16.5 million last year, the highest level since the Fed’s last bout of easy money policies following the September 11 attacks triggered a debt-fuelled boom in car sales in 2006. However some signs have pointed to potential trouble ahead. The Wall Street Journal reported U.S. auto loan delinquencies were reaching levels not seen since 2008, when they surpassed 3 percent.